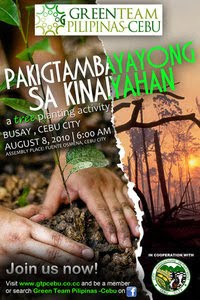 Cebu's Help to Mother Nature: "Pakigtambayayong sa Kinaiyahan"
2. To help fight against global warming..
We are all inviting interested volunteers to join us in this activity.. For those who are willing to participate, please confirm your presence through ZENITH CABARRUBIAS, 0910-821-1775/0933-465-339 4 not later than Aug. 3, 2010.. Thank you! GREEN TEAM PILIPINAS (GTP) is a non-stock, non-profit organization which will continue to implement programs aimed at saturating the masses' knowledge on how important the advocacies of Gilbert Teodoro is to uplifting their living conditions. GREEN TEAM PILIPINAS shall look forward to having a "GREEN THEME for the Philippines" by fostering an environment of oppurtunity, to free ourselves from the four faces of poverty: the poverty of the mind, pocket, relationships and the physical environment. The group shall conduct activities, with respect to the pluralistic characteristics of each region, each province, each barangay, because we believe that at the end of the day, UNITY IN DIVERSITY through localized programs to be undertaken by the GREEN TEAM can be achieved.